This summer, keep your skin looking radiant, dewy and fresh – no matter how hot it gets outside! While you give your skin a break from heavier makeup, that doesn’t mean you need to abandon your beauty routine entirely. 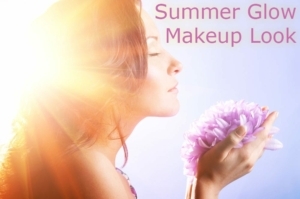 Read on for 5 tips to keep you looking stunningly gorgeous all summer long. If a primer isn’t already in your beauty staples kit, then it should be. Think of it as the base that will bring everything together, giving a smooth, flawless look. Apply after moisturiser and before any other makeup – with its ultra-light texture, you won’t even feel that you have an extra layer on. Plus it gives your make-up far better hold throughout the day, keeping everything in place from day to night. Whether you’ve got a head start on your summer tan already and want to keep it looking good, or you just want the cheat’s guide to a summer glow – bronzer is a summer must have. Avoid bronzers with an added shimmer though – for natural radiance, let the sun enhance your features instead. Don’t go for an all-over look – less is definitely more in this case! Dab bronzer strategically on cheekbones, forehead, lids and chin, and clavicles. A lighter summer beauty routine means leaving out the usual ritual of concealers foundation, but what do you do about those dark circles? A summer-ready way lighten them up is to use a tinted eye cream, followed by a light touch of light-reflecting translucent powder. To deal with fine lines under your eyes, swap powder for a cream illuminator instead. Finally, give your lashes a break from heavy mascara and opt for a clear mascara instead of the usual black or brown – this will avoid any panda-eye scenarios at the poolside or beach! In keeping with the lighter, fresher summer beauty feel, go easy on your lips too. Sticky glosses can feel heavy and uncomfortable in the heat – so to give yourself a pop of colour, go with a dab of tinted balm or a lip stain instead. If you’re more of a colour punch kind of gal, then add some matte lipstick in coral, orange or even classic red – for an instant pout that’ll leave you looking totally polished. Last but not least, try a cooling setting spray for the ultimate quick summer fix. Light and refreshing, it feels wonderfully hydrating on a scorching day – even better, it keeps skin looking and feeling plump and fresh too, as well as helping your makeup stay in place for a smudge-free result. Leaving you with a radiant, dewy complexion, make a spray your ultimate summer beauty pick. This is a test comment from Nanshy. Great suggestions for summer and also drink a lot of water.